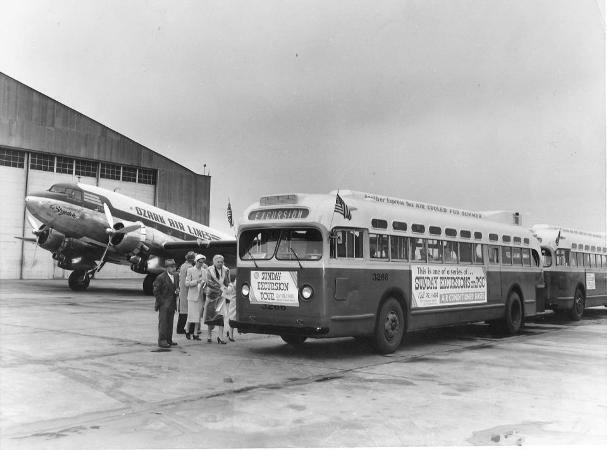 Pictured is a Public Service Company “Sunday Excursion” bus that, on this day in 1956, had transported citizens to Lambert Field to see the new Minoru Yamasaki-designed terminal (not pictured). Visitors were also treated with a tour of an Ozark Air Lines DC-3, at left. Photo courtesy of the collection of Joe Sonderman. Check out his website and books at www.66postcards.com.